The Fire were good at creating turnovers on defense and John Miller was a key cog at safety for the team, snagging All-World honors in 1991 with 6 interceptions. Originally a 5th round selection of the team in the WLAF’s positional draft in 1991, John came from the Detroit Lions whom he played a total of 10 games for in 1989 and 1990. Exceptional in pass coverage and a hard hitter, Miller would also lead the Fire in forced fumbles (4) and had a 99 yard interception return for a touchdown against the Sacramento Surge. In 1992, John made an additional 3 interceptions to finish with 9 for his career, helping the team reach the playoffs for a second year in a row on the back of the team’s stingy defense. 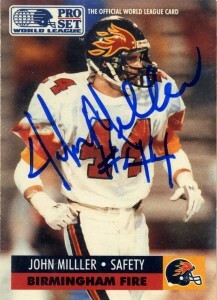 I’d get his autograph on this card after the Fire lost against the Riders in San Marcos in 1992. 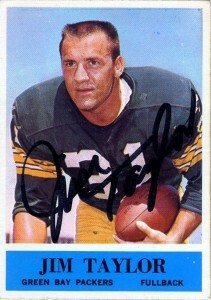 Of note a small production error as his name is spelled incorrectly as M-I-L-L-L-E-R on the front of his card. 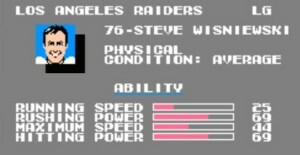 Originally drafted by the Dallas Cowboys in the stacked 1989 draft, Wisniewski’s rights were immediately traded to the Los Angeles Raiders. A two time All-American out of Penn State, “The Wiz” as he was affectionately known was one of the last great moves of the Raiders organization during the 1980s. Wisnewski would play in 8 Pro Bowls over his 13 seasons and was named to the All-Decade Team of the 1990s. A fine technician, Steve had great feet and was well coordinated athlete -which allowed him to compete at the upper echelon of the league and handle bull rushing defensive tackles with ease. Steve was also considered in many circles to be one of the dirtiest players in the league and in 1997 topped the rankings list. 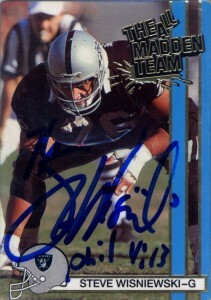 He retired in 2001 as a member of the Oakland Raider organization after starting 175 games. I got Steve’s autograph at Dallas Cowboys training camp, where he personalized the card with a passage from the bible. Philippians 1:13. “As a result, it has become clear throughout the whole palace guard and to everyone else that I am in chains for Christ.” An interesting passage. Steve since football has continued his quest for Christ. As a born again Christian he works with fellow ex-Raider Napoleon Kaufman’s church, and sells software for CIMA systems to the automotive industry. His fondest memory was being selected to the Pro Bowl for the first time in 1990, and most enjoyed playing against the arch rival Chiefs. Offensive linemen- specifically Guards rarely if ever get selected for the NFL HoF, and Steve is one amongst many that should have more fair consideration.